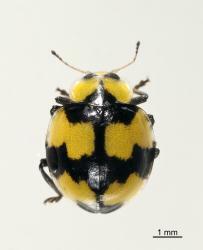 This adventive ladybird was first found in New Zealand in 1985 in Auckland. 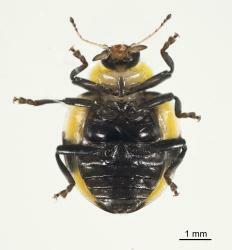 It comes from Eastern Australia and is also found in New Guinea. 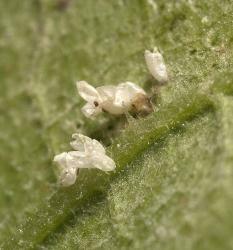 It is now present in New Zealand's North Island, where it occurs in gardens, parks, and other areas where powdery mildew fungi infested plants occur. It is most commonly seen on cucurbits (Curcurbaceae). 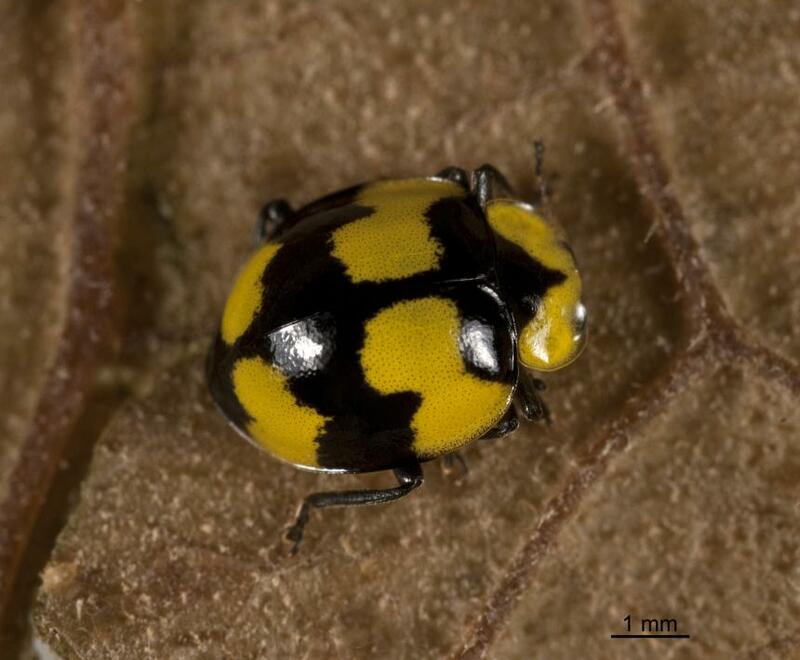 Conservation status: Fungus-eating ladybird is present in the North Island and not threatened. 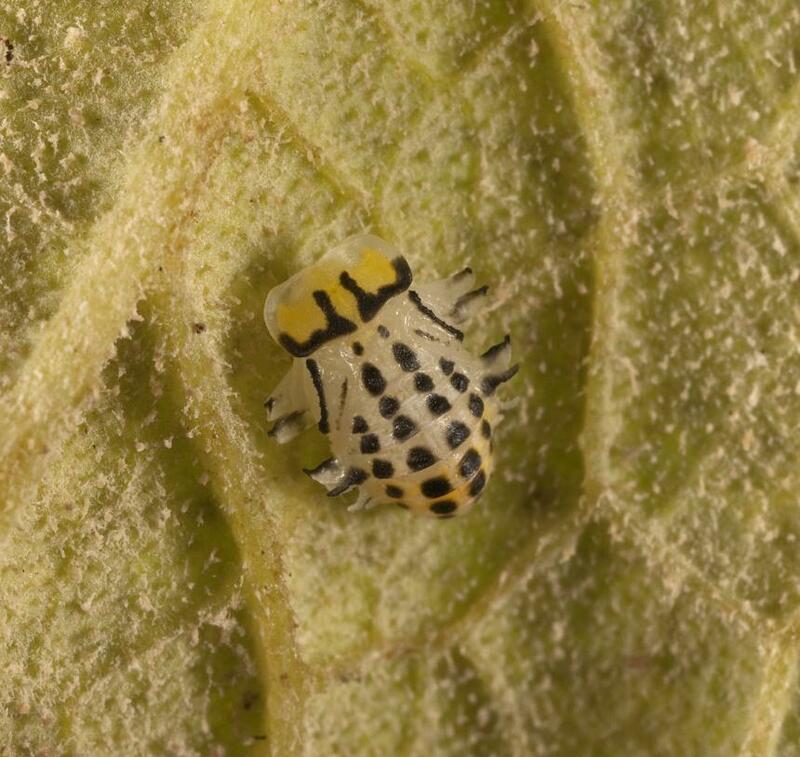 This species of ladybird over-winters as adults. There are several generations over summer. 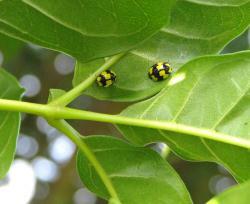 The adults are coloured yellow and black. 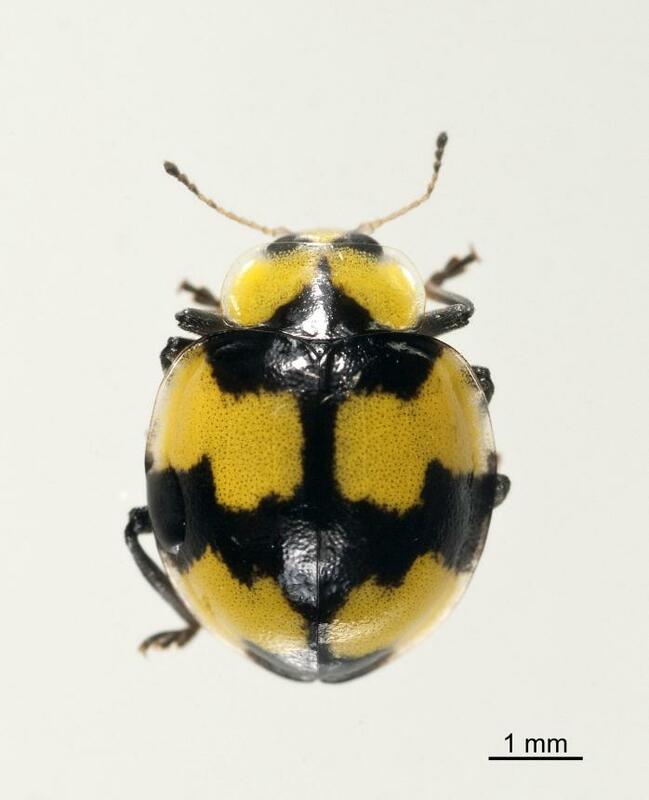 The elytra (wing covers) are black with two interrupted zigzag yellow bands. Under the elytra is a pair of wings used for flying. Like most insects, this ladybird has three pairs of legs. 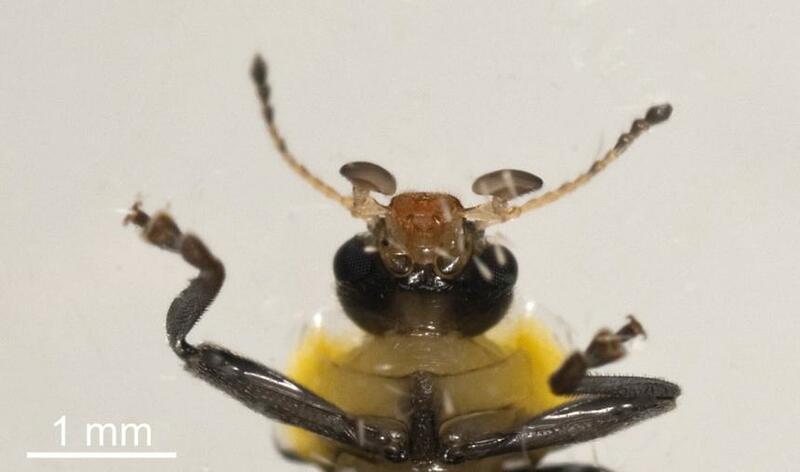 The predominately yellow head has a pair of compound eyes, two short antennae, and a pair of large palps on either side of the mouth. 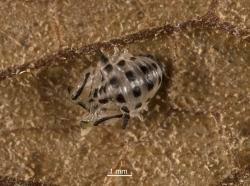 Female ladybirds lay small groups of white eggs on the underside leaves infested with powdery mildew. 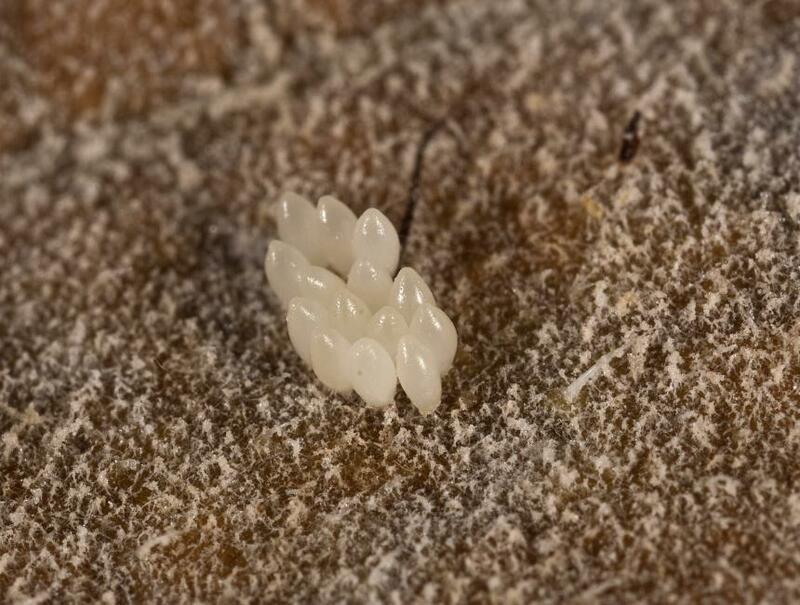 A long, grey larva hatches from each egg. The larva has black tubercles covered with short spines. 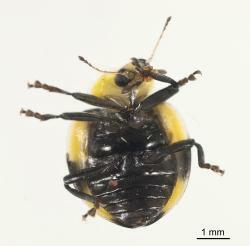 The prothorax (first segment with legs) gradually becomes yellow. The three pairs of legs are used for walking. As the larva grows it moults (changes skin). 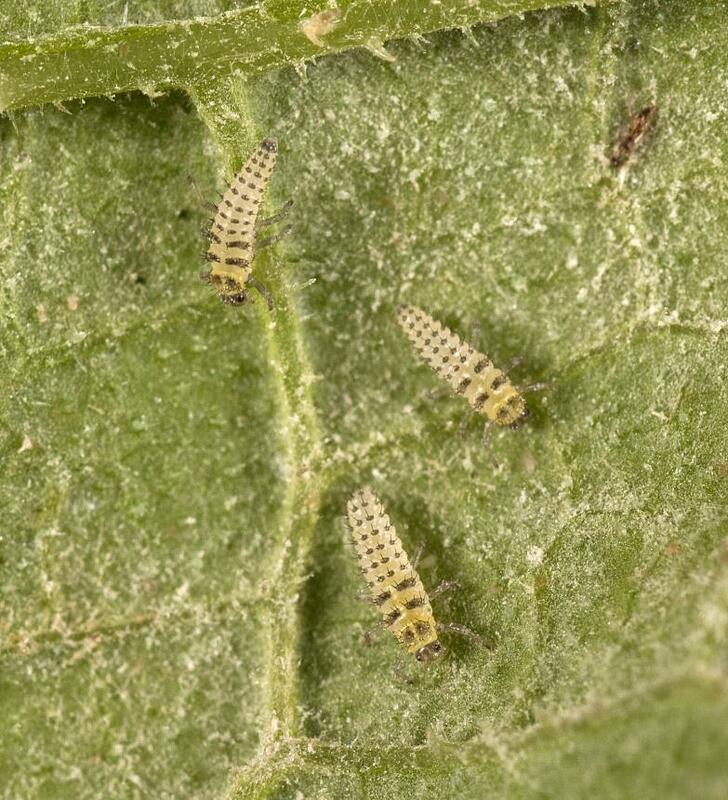 There are four larval instars (stages). 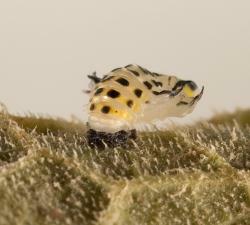 When the fourth larval instar is fully grown, it attaches itself to a sheltered place on a plant and moults into a pupa. The pupa is pale yellow-grey with black tubercles and a bright yellow prothorax. It also has prominent lateral spurs. 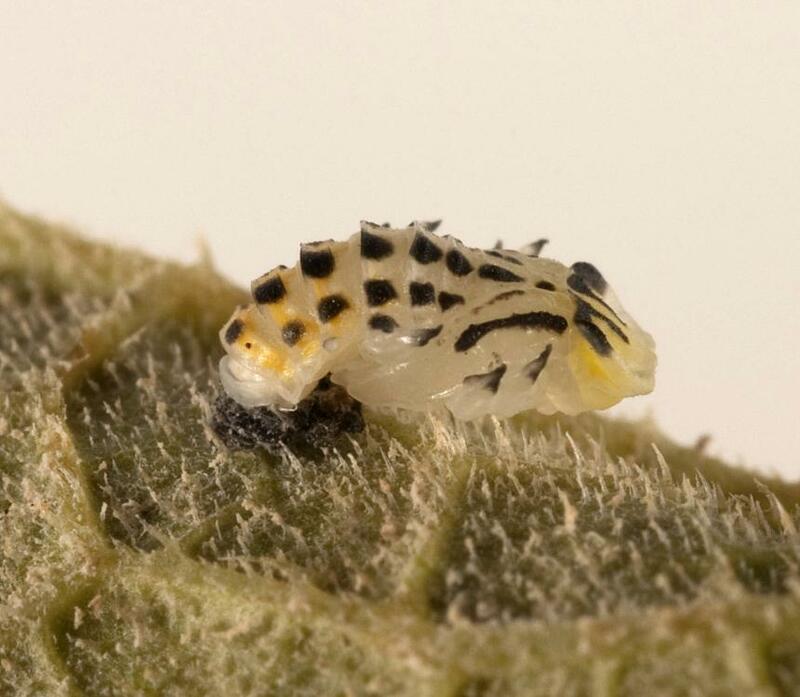 The pupa remains attached to the plant by its hind end, which is usually surrounded by the moulted larval skin. If disturbed, the pupa can wag up and down. 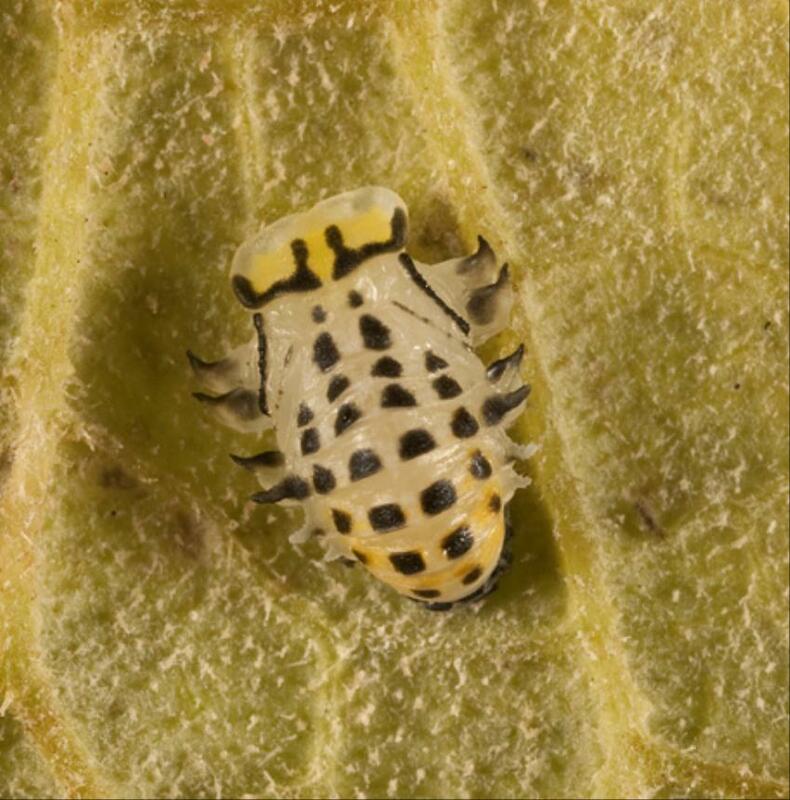 Adults hatch from pupae and mate. It is not known how males and females of this species find each other. The length of time of each life stage depends on temperature, being shorter at higher temperatures. 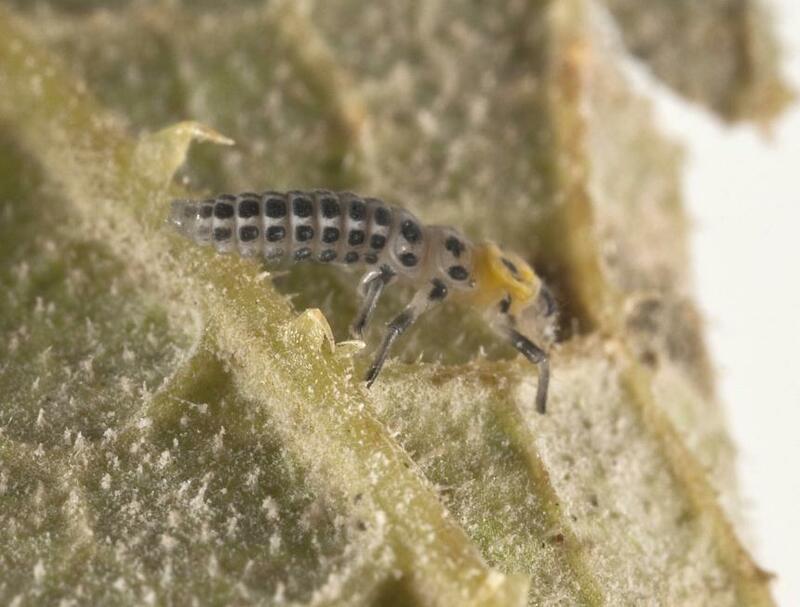 The adult and larval ladybirds eat powdery mildew fungi and are probably attracted to the smell of powdery mildew. 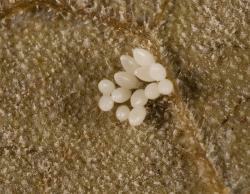 This kind of fungus forms white growths on the surface of leaves that include its fruiting bodies (spores). 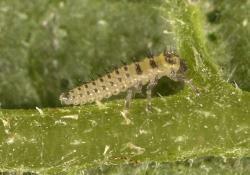 In spring the over-wintering adults may feed on pollen. The adults and larvae of many fungal feeding ladybirds have modified mouth parts for scraping fungal hyphae and spores from the surface of leaves. 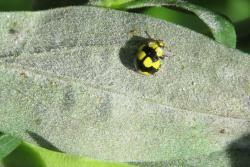 All stages of this ladybird can be easily recognised. The adults are a distinctive yellow and black. 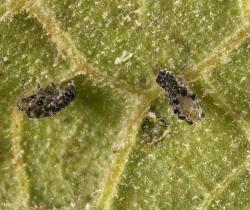 They can be found on plants with powdery mildew as well as other places. All the juvenile stages are restricted to plants infested with powdery mildew. 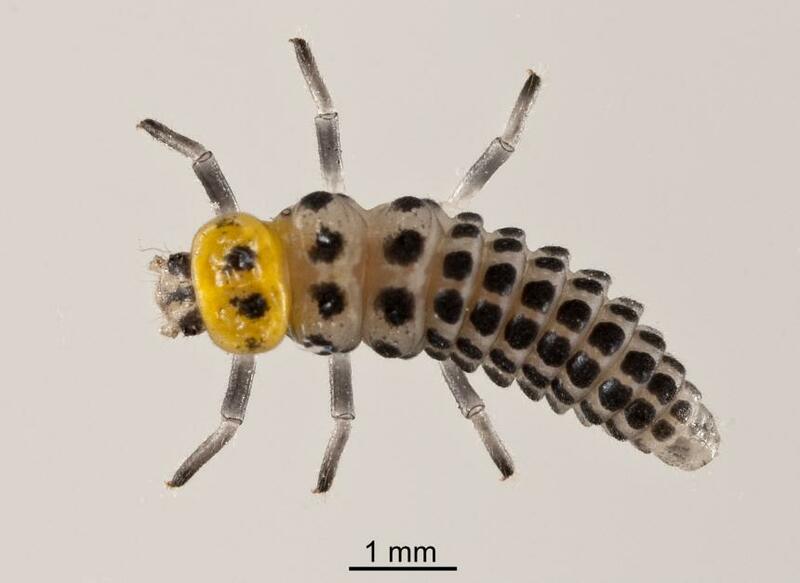 The larva is covered with black tubercles and has a yellow prothorax (first segment with legs). 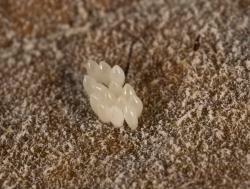 The pupa has a similar colour and has lateral spurs. Unlike other ladybirds that may be found on these plants, the eggs are white. No natural enemies are known of the fungus-eating ladybird in New Zealand. They may be fed on by birds, spiders, and insect predators. 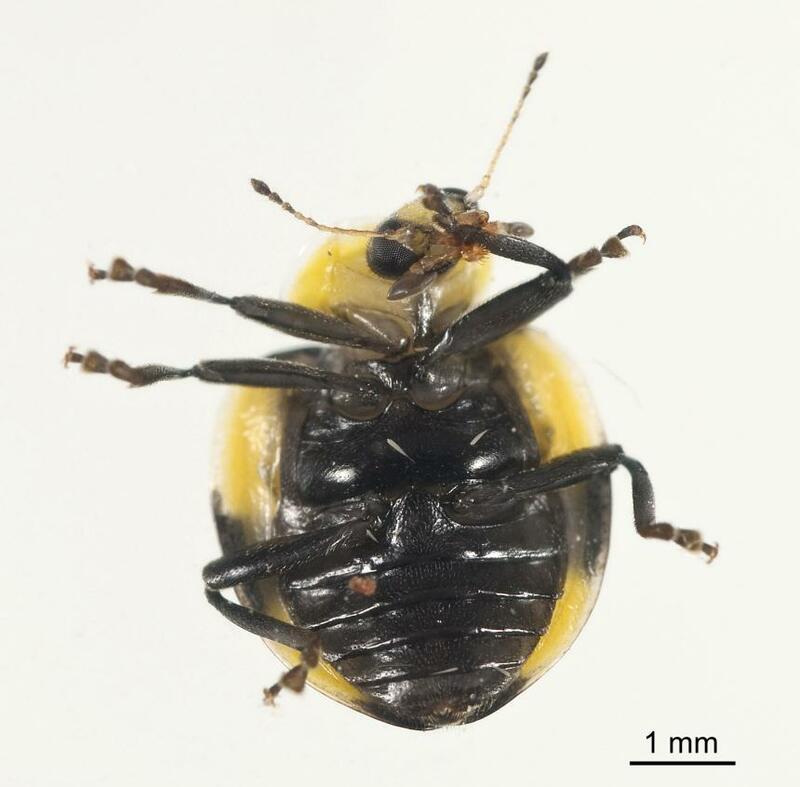 The wasp Dinocampus coccinellae (Shrank 1802) (Hymenoptera: Braconidae), parasitizes adults of some species of ladybird. It is not known if it attacks the fungus-feeding ladybird. 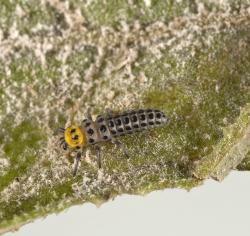 The fungus-eating ladybird feeds on powdery mildew fungi that are found on a wide variety of plants. 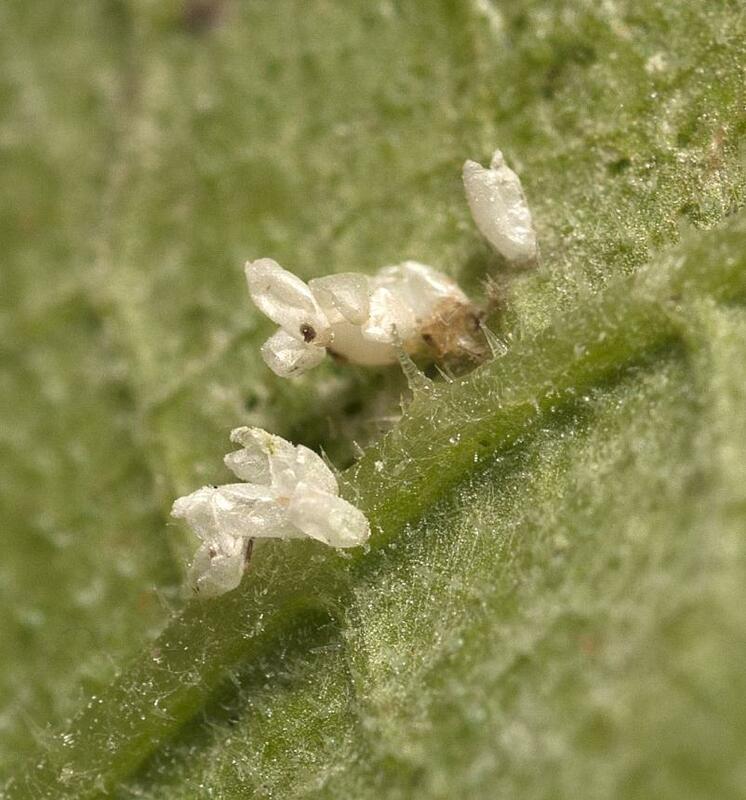 Powdery mildews are commonly seen on leaves of cucumber, squash, pumpkin, zucchini, and other cucurbit (Cucurbitaceae). 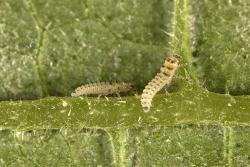 They are also present on many other plants. 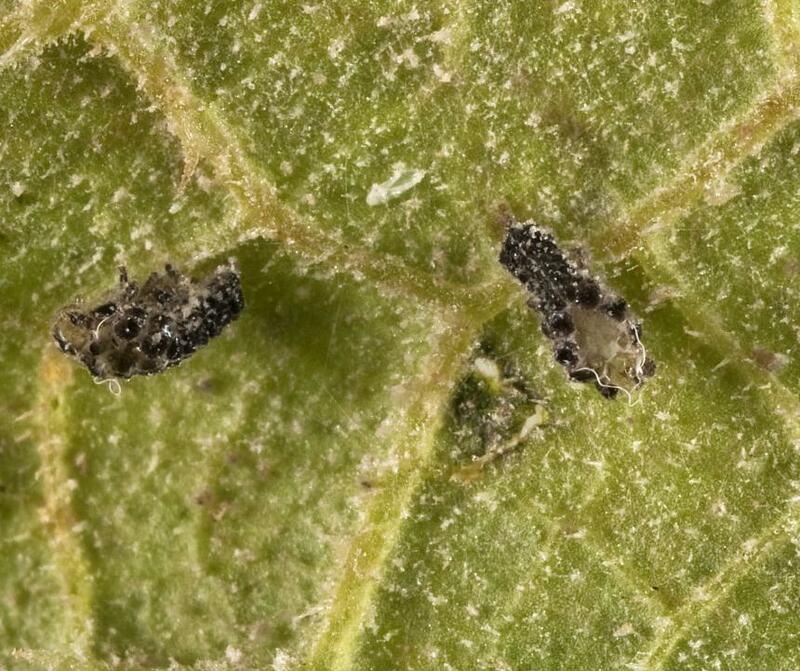 Adults are probably attracted by the smell of powdery mildew. In Australia overwintering adults feed on pollen in spring, including pollen of wattles (Acacia) and privet (Ligustrum) species. Table: Host plants of the Fungus eating ladybird, Illeis galbula (Coleoptera: Coccinellidae) from Plant-SyNZ database (15 July 2017). The reliability score shows the quality of evidence for the host association (1-10, 10=high). The bright colour of some ladybirds is believed to be a warning to potential predators such as birds. These brightly coloured ladybirds contain various alkaloids that may make the beetles taste unpleasant. 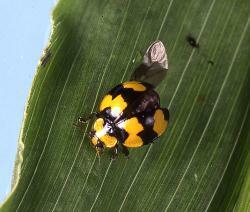 It is not known if the fungus-feeding ladybird contains any of these chemicals. 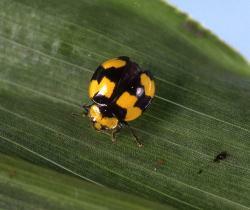 Many ladybirds are predators and feed on insects; some feed on mites. 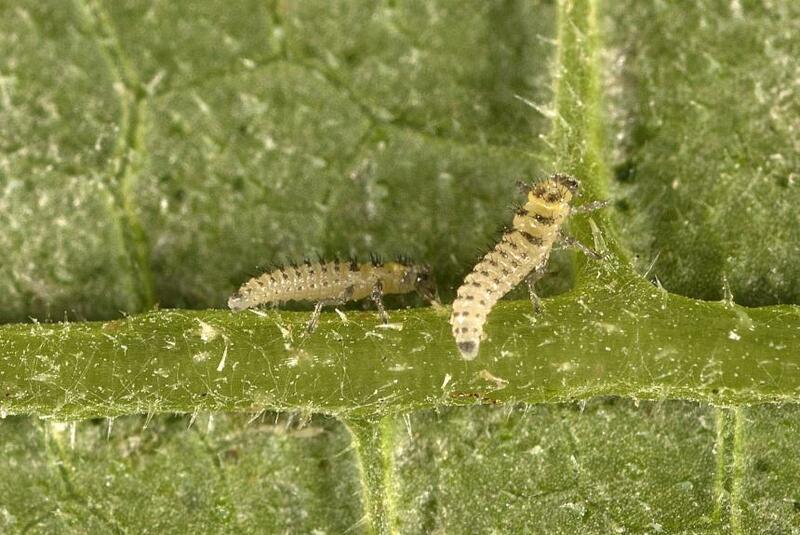 Other species eat plant leaves and are pests in some tropical countries. One plant feeding species, Epilachna vigintioctopunctata (Fabricius, 1775), has established in New Zealand and feeds on Solanum species. There are also ladybirds that feed on fungi. The only species in New Zealand known to feed on fungi comes from Australia. Pope RD 1989. 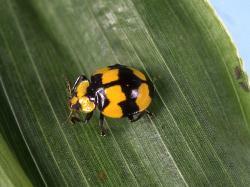 A revision of the Australian Coccinellidae (Coleoptera). Part 1. 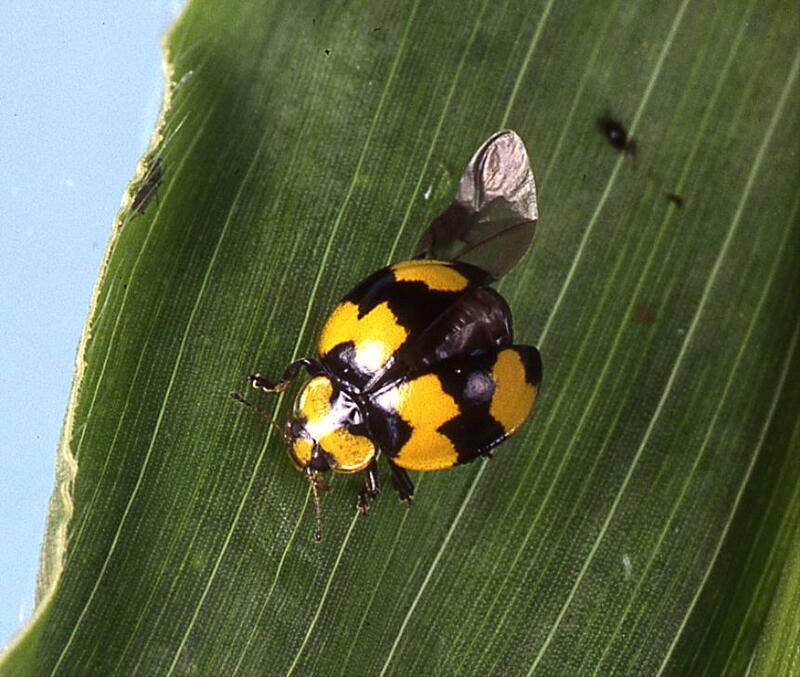 Subfamily Coccinellinae. 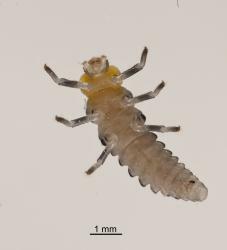 Invertebrate Taxonomy 2 (1988): 633-735. Slipinski A, Hastings A, Boyd B. 2011. 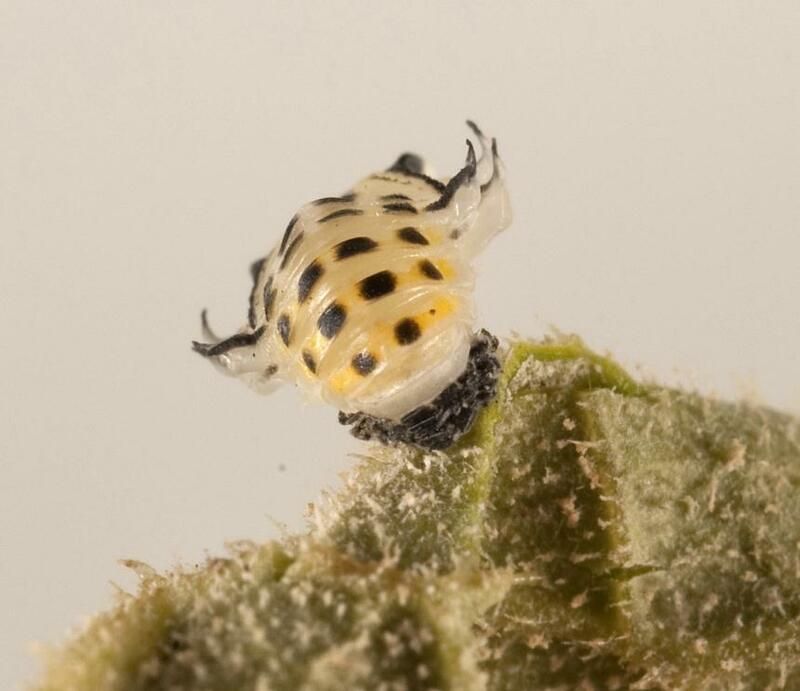 Ladybirds of Australia. 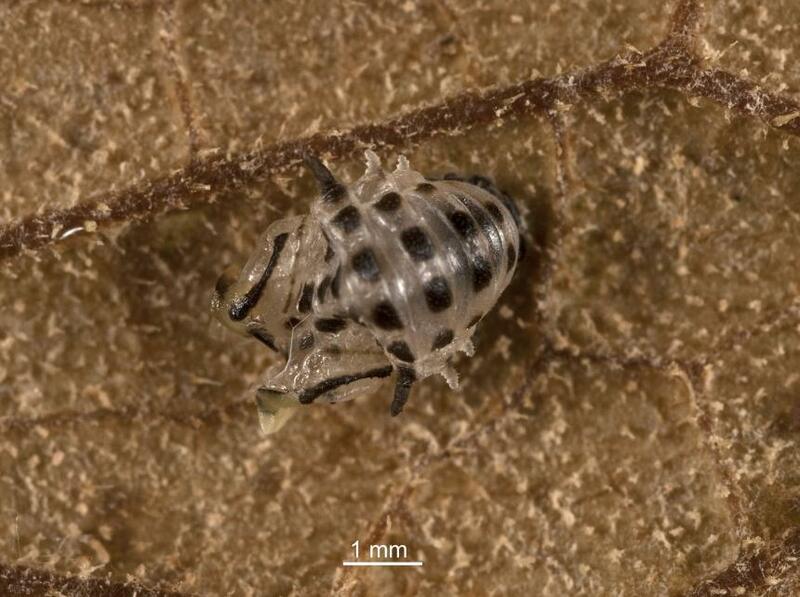 ento.csiro.au/biology/ladybirds/ladybirds.htm. Sutherland AM, Parrella MP 2009. 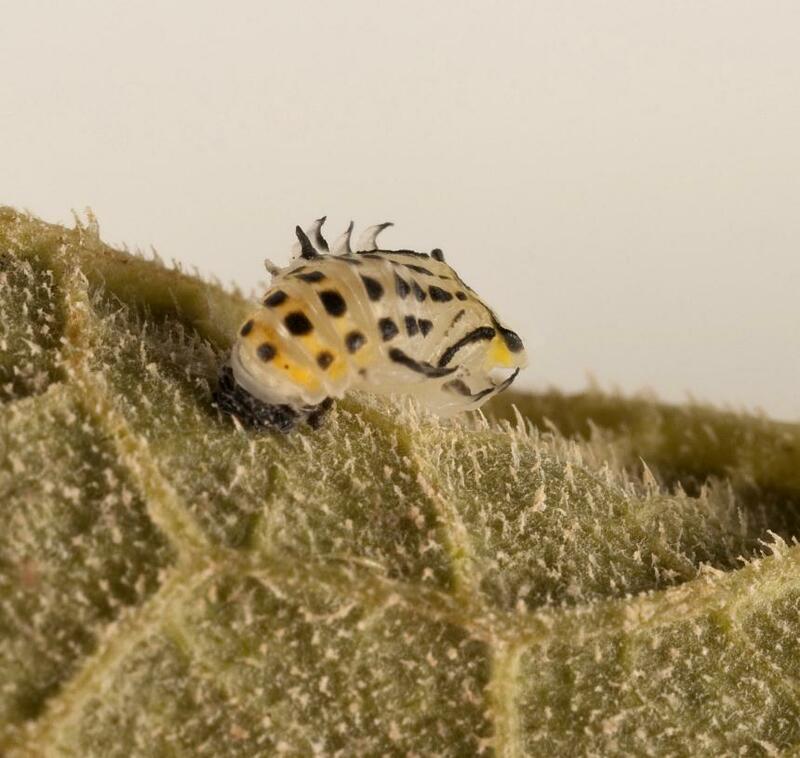 Mycophagy in Coccinellidae: review and synthesis. Biological Control 51(2): 284-293. 1 August 2017, NA Martin. Add new photo, update host plants. Martin NA. 2016, revised 2017. 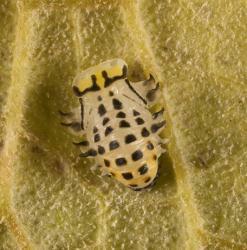 Fungus eating ladybird - Illeis galbula. Interesting Insects and other Invertebrates. 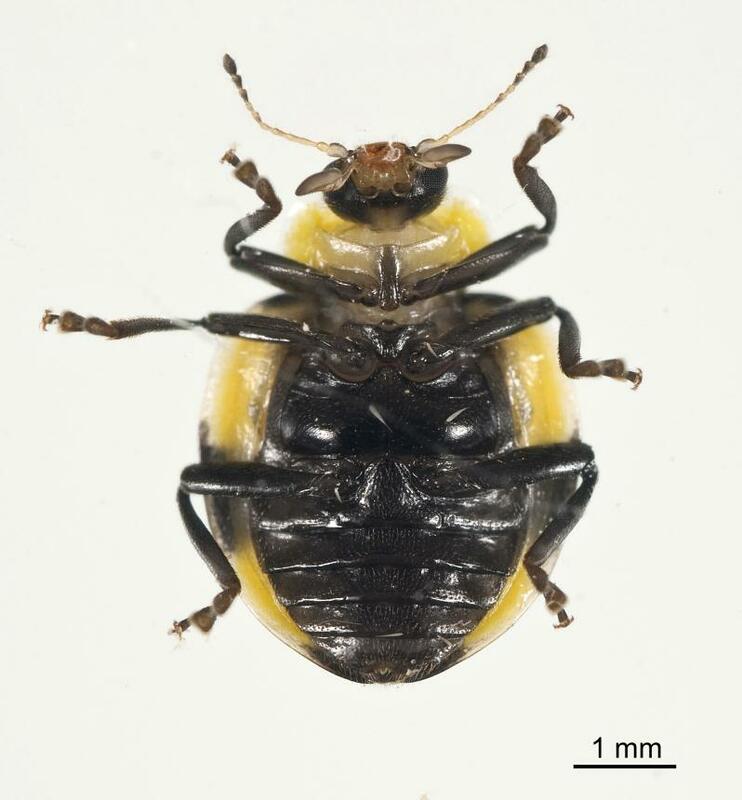 New Zealand Arthropod Factsheet Series Number 26. http://nzacfactsheets.landcareresearch.co.nz/Index.html. Date Accessed. ISSN 1179-643X.